With the amount of time most of us spend looking down at our phones and working on the computer all day (and night), just about all of us have some poor posture. We all probably should have listened to our mothers growing up and made sure we stood up tall and didn’t slouch. All kidding aside, this is still good advice for us today and everyone should be more conscious of their posture. Our DIY stretch of the week is great for correcting forward shoulders and poor posture. It’s essentially the same motion you’d make in the snow for snow angels. However, once a year in the snow is not enough to correct years of poor posture; therefore, we recommend doing this exercise 4-5 times per week. It goes by the name of wall angels. Step 1: Start with your back flat against the wall, especially concentrate on keeping the middle of your back flat. Next, walk your feet out about 1-2 feet from the edge of the wall while still maintaining your back flat against the wall. Place the backs of your arms and the back of your head against the wall if you are able to. You might start to feel a stretch in the middle to upper part of your back; don’t overdo it. The entire exercise should be done to your comfort level. 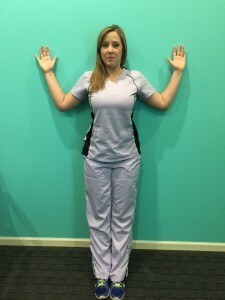 Step 2: Now begin to lift your arms above your head while still trying to keep everything touching the wall, including the back of your head. Imagine you are doing snow angles on the wall is the best thought to keep in mind for doing it all properly. You should start to feel a stretch between the shoulder blades and the middle of your back. Step 3: Slowly lower your arms down so that your back relaxes. You have two options as to how long to hold the stretch. You can do the stretch as 3 sets of 10-15 reps or you can do 3 sets of 15-20 second holds above your head. Overall, this is a great exercise to do 2-3 times per day. Don’t overdo it, but it’s a great way to reverse poor posture and the constant leaning forward and looking down that we do all day. Research shows that for every inch your head moves forward, it puts about twice as much stress on your spine. So looking down at your phone all day puts constant stress on your spine and neck. This causes neck pain and headaches in the short term and can lead to degeneration and severe neck pain in the future, possibly even surgery. Fortunately, there are some options for improving years of poor posture and reversing the stress we put our spines through. The same thing that got us into poor posture and neck pain can get us out of it. Of course, we recommend chiropractic care and adjustments, but you can do simple exercises each day to help encourage proper posture. Follow our blog and stay tuned for future advice on correcting poor posture and other health concerns. *As always, consult with your healthcare provider before beginning any exercise program.